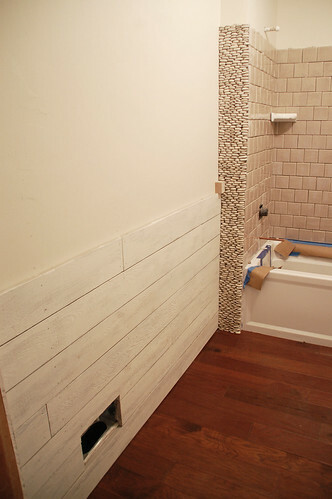 So far the rustic white wood trim on these bathroom walls has been the easiest project of the house to tackle. With much less effort than, say, doing a left-handed cope on some baseboard, it adds a layer of texture to the mostly white room, without being too overbearing. Here’s how I did it, in just a few easy steps. For my bathroom wall I used some 1×6 rough-sawn cedar boards that were left over from trimming out some of our porch beams. 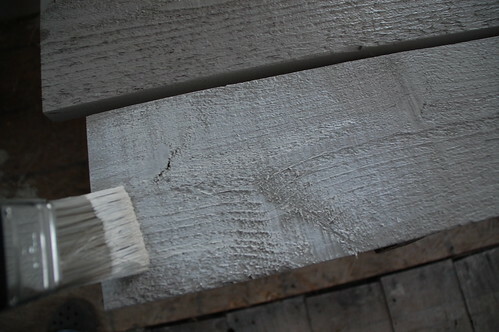 While you can use any 1×6 for a smooth finish, I suggest rough-sawn for a rustic look. I know my local Lowe’s carries rough sawn cedar in the lumber aisle. 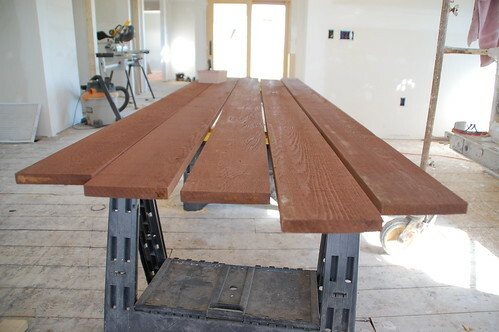 The stuff I had was pre-stained an awful maroon color, something I’ve been correcting with my hand planer for the exterior wood, one board at a time. For the bathroom, all I needed was a little paint. I started by rolling on a medium tan/gray (Benjamin Moore’s Valley Forge Tan). 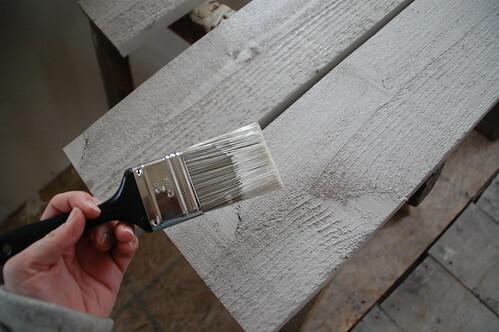 You could use almost any shade of brown gray or tan for the base coat. I found it easiest to roll on a coat of the base color with my 4″ roller. I also rolled the back to keep the wood fully protected from any moisture in the air from the shower in the full bath. I know a lot of people try watering down paint with actual water, but for this weathered look “dry brushing” is a better technique. 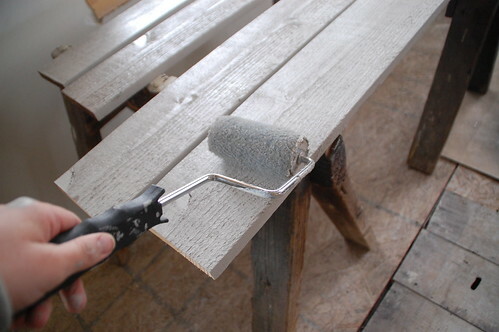 With just a little paint on the brush, paint over the wood a number of times to build up the paint without gooping it on. Gooping. It’s a technical term. Here’s what they looked like finished. I tried not to make it too consistent between boards. 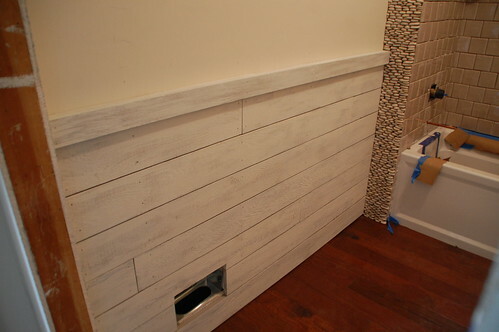 My bathroom was a small area, but I still maximized my wood by measuring full lengths, and then using the leftover on the next course up, making sure to end the wood on a stud. Since they were 6″ wide I cut them with the miter saw, but this is the part you can hand-saw or have pre cut (after taking all your measurements ahead of time, of course) if you don’t have a tool addiction like I do. One-bys can be attached with 2″ finish nails. The best idea is to nail directly to the studs. 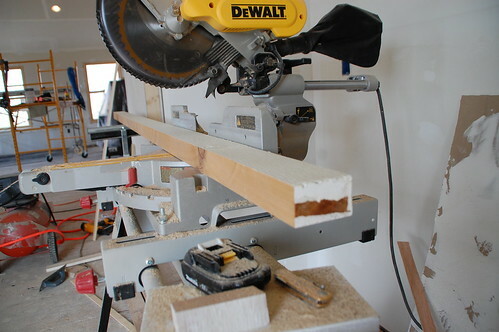 In my case, I noted the stud locations before drywalling, but if you can find even one stud, it’s a pretty sure bet if you measure 16″ out you’ll hit the rest of them. 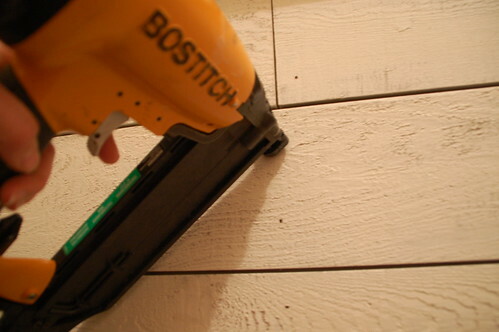 My Bostitch finish nailer did the job just fine. I started the first board using a level and then used shims to keep the boards about 1/8″ apart as I moved up the walls. In this case I went about three and a half feet up with 1x. You could run the 1x all the way up the wall (and I think it would look awesome, so I was very tempted to go that way) or finish it off with a slightly thicker piece. An actual 2×4 looked too thick, so I ripped one down to 2×3 on the table saw. These were cedar boards also left over from trimming out our windows. After trimming them down to size on that gorgeous miter saw, and painting them, I attached them the same way the rest of the boards went in. 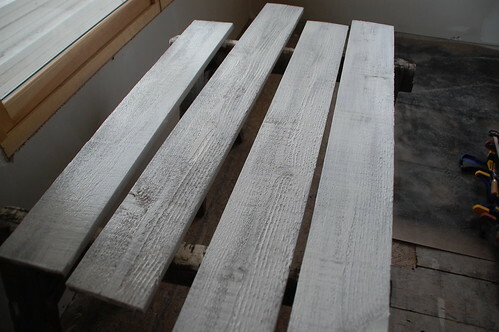 You could do this with any type of 1x–horizontal or vertical– but I’d be hesitant to put a thicker board on the walls. After that, it’s just sit back and enjoy. Or in my case, continue tiling the tub, the master bathroom, and installing floors and cabinets. I love the rustic look of the wood on the walls. Just a thought, but that looks like a pretty rough blade for doing finish work, have you tried with a 60 or 80 teeth blade for the miter saw ? Makes a huge difference ! I love the look you’ve got going here… Rustic, yet the boards remind me of the beach…you (& maybe Mystery Guy) are innately creative! Looks beautiful! Is it just one color of paint – the Valley Forge Tan – or is there a second shade layered on to make it look more white? Oh wait, I just saw that the materials list includes a white paint, too. It’s VFT with the roller and then Chamois with the brush – is that right? Hello, Your site is amazing and inspiring! This wall is a must do on my home list, Thanx! Love it so much I’m pinning it.